Select a Location All Beverly Hills Charlotte Dallas Detroit Grand Rapids Greensboro Las Vegas London Los Angeles Maui New York City Palm Desert Santa Monica Washington DC. loc All Bahrain Los Angeles Washington D.C.
loc All Atlanta Boston Chicago Dallas Houston Las Vegas Los Angeles Philadelphia San Francisco Seattle Washington D.C.
You are signed up for the mailing list! The ReServe API is missing some information. Wolfgang Puck Catering is dedicated to sharing our passion for culinary innovation, uncompromising quality and genuine hospitality with our clients and guests. From workplace dining and cultural centers to special events and sports & entertainment venues, our unique approach to dining offers a seamless blending of our clients’ business and ours, with all of the welcoming hospitality for which we are known. Farm to Table | It’s not a trend to us. Our teams collaborate with farmers to highlight the seasonality of our markets and the best-quality ingredients. Open Kitchen | Spago put the chef center stage to welcome guests and create excitement. 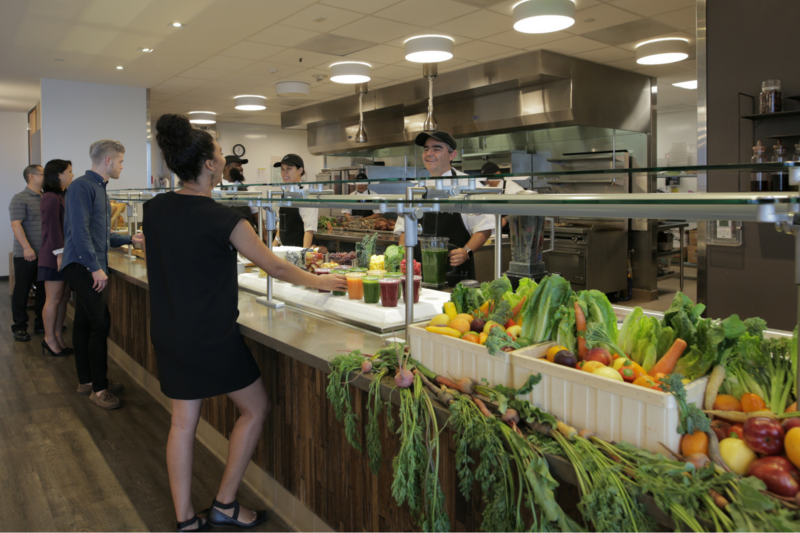 Whether at one of our public restaurants or in our on-site kitchens, we create open spaces to encourage interaction among guests and staff. Innovation | Leaning forward and striving to stay ahead of the curve, Wolfgang pushes our teams to take risks and stay curious. We are always looking for unique ways to wow our guests, regardless of service style. Approachable Luxury | The smoked salmon pizza is an iconic example of Wolfgang’s unique style of approachable luxury. Our teams emulate this style on the simplest seeming offerings by highlighting seasonal produce, innovative presentations and utilizing the highest-quality ingredients. We create dining experiences that range from approachable cafes and grab-and-go concepts to formal sit-down restaurants, large-scale gala events and intimate test kitchen experiences. Our seasoned team members create individualized programming that reflect the culture of our partners. Austrian-born chef Wolfgang Puck and Carl Schuster founded our chef-driven organization in 1998. We have more than three decades of experience delivering best-in-class dining experiences in diverse environments. We partnered with Compass Group in 2004, with our CEO Carl Schuster and founder Wolfgang Puck retaining management control. Wolfgang Puck has revolutionized the dining landscape with a singular focus: to exceed expectations whenever our guests gather for a meal. Welcoming Warmth | Our passion for hospitality sets the tone for our service. Our teams provide restaurant-style service from the moment our guests walk through the door until the moment they leave. humble, expert service to each and every customer and guest. Sophisticated and Innovative | We are trendsetters, constantly searching for new and creative ways to deliver unique experiences to our guests. Our teams focus on sourcing exciting new ingredients, innovative equipment and cooking technologies that allow us to excel in delivering elevated food and beverage offerings in a variety of environments. Forward-Thinking and Flexible | We strive to push the boundaries of food and beverage programming at every turn. We elevate dining offerings by creating experiences relevant to the current culinary landscape and positioning ourselves as well as our partners for flexibility and evolution in the future. To inquire about workplace dining with Wolfgang Puck Catering, fill out the form below and our representative will be in touch shortly. Receive exclusive offers and tips from Wolfgang Puck!